Welcome to our beautiful mountains and The North Shore Inn! 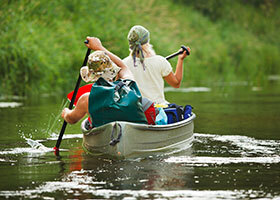 You will not find a shortage of activities while visiting. 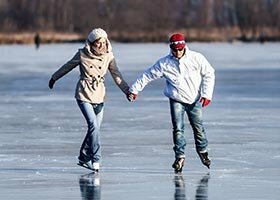 From boating and fishing, to ice skating and bowling, there is always something fun and exciting to do! 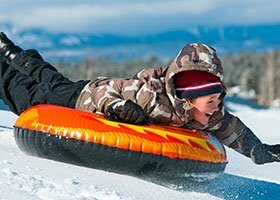 Just a few more miles of travel on Scenic Highway 18 brings you to Green Valley Lake, home of the Big Air Snow Board Park and Green Valley Lake Recreation area, as well as Snow Valley Ski Resort. 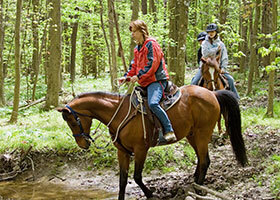 Snow Valley has a full calendar of year round activities and events including mountain bike riding, fishing and horseback riding. Several miles further on will find you in Big Bear Lake, the largest of the mountain towns with many entertaining options. If you prefer to sit back and let someone else do your driving, there is a very efficient public transportation system available - linking most communities on the mountain to the urban San Bernardino area three times daily for a nominal fare. This is also a fun way to see parts of the alpine communities you might otherwise miss. 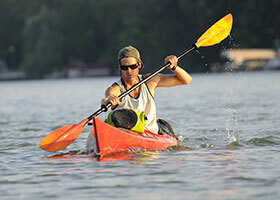 Now at Lake Gregory you can either rent a kayak or bring your own and launch for a nominal fee. For all prices and information, please call (909) 338-2233. Come fish year round at Lake Gregory - Trout, Bass, Catfish, Crappie, Carp and Bluegill -- The trout fishing is usually very good with plenty of five-fish limits caught on Power Bait (brown, green and rainbow colors), Super Dupers (copper and gold), Kastmasters (gold and silver), and Rooster Tails (all colors). Trolling from rental boats is very productive, especially if you bring or rent an electric motor, as well as float tubing, and shore fishing (free) almost all around the lake from dawn to dusk. 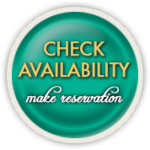 For boat rental prices or other information, please call (909) 338-2233. The State of California requires anglers to hold a valid fishing permit. If you are 16 or older, you need a license. 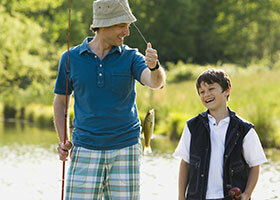 Fishing licenses are available at most sporting goods stores and marinas. There are restrictions: Generally the catch limit is 5 in the lakes and two in the streams. Anglers in the wild streams are encouraged to "catch and release." 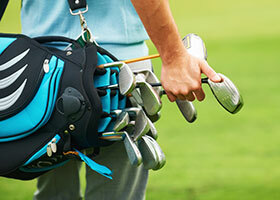 Some fishing also restricts the type of equipment you may use. A basic license is for using one rod at a time. For more detailed information on hunting and fishing in California, contact the California Department of Fish and Game at (916) 227-2245. Couples & small groups alike find this to make for a great mountain visit. Award winning wines, local hard ciders at breathtaking Ranch in the mountains with Zinfandel & Syrah vineyards.Go and taste their award winning Red Bordeaux as well as the red & white wines. A visit to the Lake Gregory / Lake Arrowhead area isn't complete without seeing the view from the water of Lake Arrowhead. You'll ride in style in the enclosed Lake Arrowhead Queen paddlewheel boat. Experience the beauty and excitement of a narrated tour of Lake Arrowhead aboard the elegant Arrowhead Queen. The splendor and serenity of the lush forest, sparkling water and blue skies glide by, as you sit back and enjoy close-up views of exquisite lakefront homes and learn about the fascinating history of the lake. All of our boats run year round, weather permitting. Do you love to play Frisbee but want more of a challenge? Come test your skills in accuracy at a Frisbee Golf Course. The course begins at the lower field and meanders through apple orchards and blackberry field, and ends atop the Sled Hill. Maps and score cards are also available. The cost for this is $10.00 per person ($8.00 is refundable deposit). 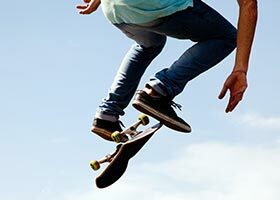 Located next to Goodwin's Market and across the street from Lake Gregory, our skate park provides great fun for both novice and veteran skate boarders alike! Open to the public and free of charge. In 1993, a 3,400-acre site within the San Bernardino National Forest was set aside to create the first Children's Forest in the United States. To begin the fulfillment of its unique mission of involving youth in taking care of the forest, 40 young people from around the country were selected and brought to work side by side with key Forest Service staff and other experts. They designed a trail and interpretive exhibits along the trail that teach young people about the forest. 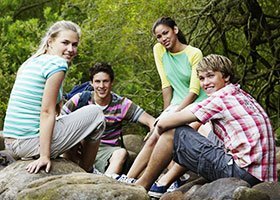 Youth were also involved in the development of ideas for educational programs and activities that could be offered within Children's Forest. The mission of Children’s Forest is to provide a place where (1) youth can participate in stewardship, research and education projects to develop skills in communications, leadership, and problem solving, and (2) youth and families can participate in programs to learn how to explore a forest setting. Children’s Forest provides young people with opportunities to participate in projects that integrate social, economic, educational, and environmental dimensions in order to prepare them to be the future stewards and decision makers for the earth’s shared resources. For more information on visiting Children's Forest, please call (909) 867-5996. Welcome to the San Bernardino Mountains! 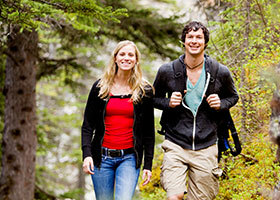 There is no better way to experience the various aspects of Nature than to take a hike. The sounds, smells, and "feel" of the forest become more immediate, personal and meaningful. The trail around Lake Gregory is a peaceful walk and, best of all, just across the street from The North Shore Inn, or choose from one of sixteen different trails. High Adventure is a very unique husband and wife team, Rob & Dianne McKenzie. They have both been involved in foot-launched flight since 1974. Being available 7 days a week year round (weather permitting), they provide USHGA Certified, personalized instruction and service at Andy Jackson Airpark, in San Bernardino, California (just 90 minutes east of Los Angeles). Their low key but dedicated efforts will make your visit a pleasant and productive one from start to finish. Their full service repair shop and home office are just minutes from one of the best flying sites in the world, Crestline/Marshall Peak. Of particular interest to most students is the highly professional tandem instruction available both in hang gliding and paragliding. This is considered by far the best way to learn the approach into the Andy Jackson Airpark. Rob and Dianne have conducted over 8000 safe tandem flights in their many years in the business and have earned worldwide respect. Tandem instruction is where the instructor and student fly together in the same glider. 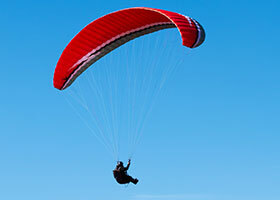 It is commonly accepted in aviation as the "best" way to learn to fly. By doing this you can experience high flight just as you eventually would when solo but with the experience of an instructor to enhance your safety. When you fly tandem, you are not merely along for the "ride" but actually get to take the controls in an organized lesson. For more information, please call (909) 883-8488. At a base elevation of 6775', Rim Nordic Ski Area is located on Highway 18, 5 miles east of Running Springs, across from Snow Valley Mountain Sports Park on the way to Big Bear Lake. 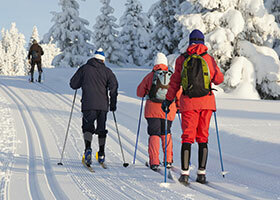 In the winter, we offer Cross Country Skiing and Snow Shoeing. 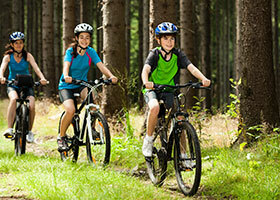 Our summer activities include Mountain Bike Racing & Trail Runs. We are only 1 1/2 hours from L.A. and Orange County and 2 1/2 hours from San Diego. Rim Nordic boasts 12 miles of groomed trails, lots of off track. Call (909) 867-2600 for information. The San Bernardino National Forest offers three ski resorts under permit for you to enjoy downhill skiing and snowboarding, and a cross-country / snowshoeing resort. Cross-country skiing and snowshoeing are dependent on natural snow accumulation that can vary depending on elevation and type of exposure. North-facing slopes tend to accumulate more snow. Snow surface conditions are so changeable that waxless skis are preferred by most. Snow Valley is the closest ski area to the valley floor, just five miles east of Running Springs on Highway 18. With 13 lifts and 240 acres of powdery terrain, Snow Valley has something for every level skier and boarder. Schighridj (pronounced Sky Ridge) Terrain Park offers more than a mile of downhill fun with numerous hits, spines, and tabletops. Snow Valley features a wide variety of ski-able and ride-able trails and terrain. A favorite of skiers and boarders of all ages, Snow Valley has enjoyed more than 60 years as a celebrated winter resort. We offer special rates exclusively for our guests. Call 909-338-5230. Snow play is a popular past-time throughout the mountains. Winter parking is always a problem when finding a place to play in the snow, so be sure to park well off the road (you must be outside the white line painted on the right side of the highway) and do not block other vehicles or the snowplow. Remember, a National Forest Adventure Pass is required to park in the National Forest while you are playing in the snow.